I am no fashion maven, but vintage fashion seems to be gaining popularity. Maybe it's just me but I am coming across more and more vintage designer clothing stores. 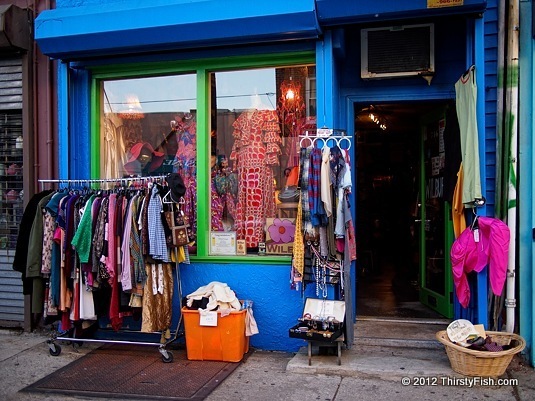 This is the storefront of Wilbur Vintage located on Fabric Row, in Philadelphia. I am hoping that mom and pop stores that carry quality and unique items become prominent so that shopping becomes enjoyable again. Mall culture is truly annoying. It is time that we oppose mega-stores that put small tradesmen and craftsmen out of business with cheap Chinese products and shady business practices. There is something fundamentally wrong with making billions of dollars at the expense of one's employees. I agree that we shouldn't punish success, but, many large corporations are following a different set of rules than the rest of us. They lobby politicians to purchase legislation and immunity, abuse tax loopholes and come up with deceptive ways to transfer our wealth to themselves. That is not success. Kudos to mom and pop stores. Update: I didn't expect that there would be be corporate apologists among you. Please reread the above paragraph. There is nothing wrong with success, with making billions of dollars. Just as it would be a fallacy for me to bundle all corporations together and label them all as evil, it is a fallacy for you to suggest that corporations are simply good because they are financially successful. How they achieve success, how they benefit their employees and society in general is more a measure of success than their financial worth. Rigging the game, avoiding taxes, cheating employees and customers, and insatiable greed, do not amount to success irrespective of the money made. Think of the ENRON scandal, or the current Global Financial Crisis which were both triggered by highly respected, "successful" businessmen. Or, watch George Carlin describe the The American Dream.